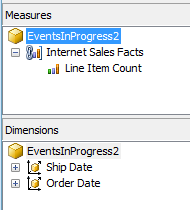 I then created a second cube, ‘EventsInProgress2’, using the ‘Create Empty Cube’ option in the Cube Wizard. 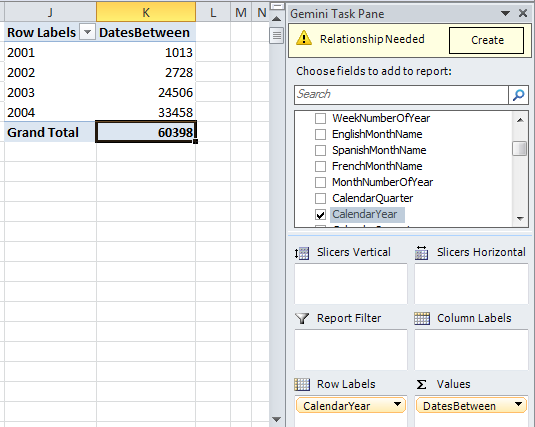 There are various ways of calculating a total-to-date in MDX and I’ve not spent any time working out if the version I’ve shown above is the most efficient. There is going to be an overhead from querying a linked measure group rather than a regular measure group, and also probably an overhead from trying to query the same source measure group twice rather than two different measure groups, but I don’t know how significant it is. If anyone out there does decide to try this at scale with their own data, please leave a comment and tell me about your experiences. 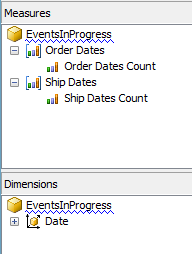 I wouldn’t admit to this in public (at least to an audience of normal people, rather than the Microsoft BI geeks reading here), but over the last few years I’ve been obsessed with solving the ‘events in progress’ problem in SSAS and MDX. 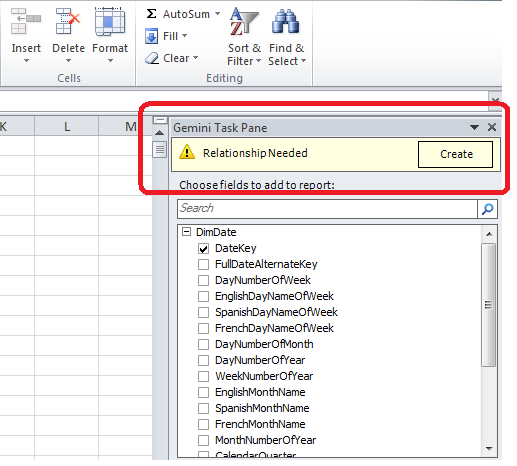 I’ve tackled it successfully in PowerPivot and DAX (see here and here) but I always thought there was no good solution in SSAS, and certainly other people such as Richard Tkachuk who have written about the same issue have come to a similar conclusion. But… last week I found one! So in this blog post I’ll outline the basic approach, and in my next post I’ll detail an even better, if more complex to implement, solution. The two blog posts linked to above describe the problem in detail, but here’s a quick overview. 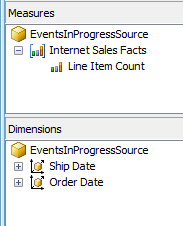 In the Internet Sales fact table in Adventure Works each row represents a line item on an invoice, and each line item has an Order Date (ie the date the order was received) and a Ship Date (ie the date the order was shipped to the customer). We would like to know, on any given date, how many invoice line items are part of orders that have been received but not yet shipped and so have an Order Date before that date and a Ship Date after that date. 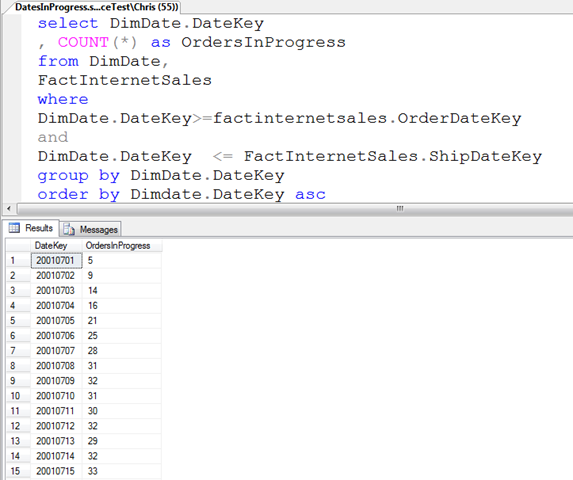 Since BIDS won’t let you build two measure groups from the same table in the DSV, I created a named query that duplicated the Internet Sales fact table and used that as the basis of the Ship Dates measure group. 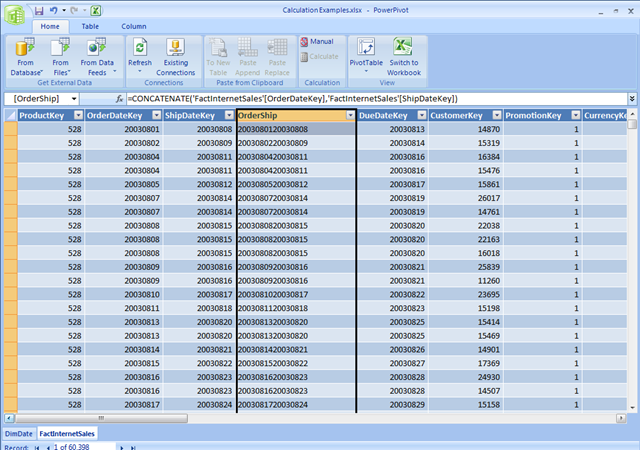 Both the Order Dates Count and Ship Dates Count have AggregateFunction set to Count, and the Date dimension joins to Order Dates on OrderDateKey and Ship Dates on ShipDateKey. 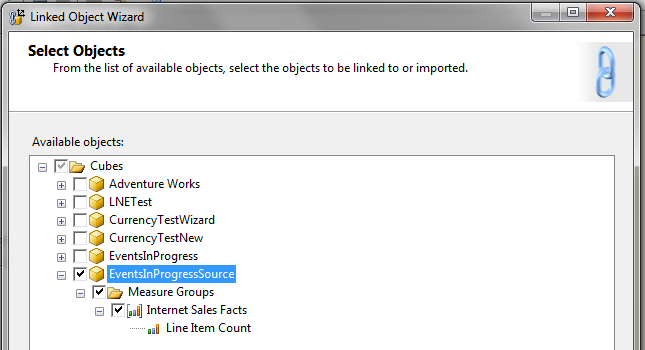 And it’s pretty fast, too – certainly much faster than any other solution I’ve tried before in SSAS. There’s one obvious catch here though, and that is that you have to load the data from your fact table into your cube twice. 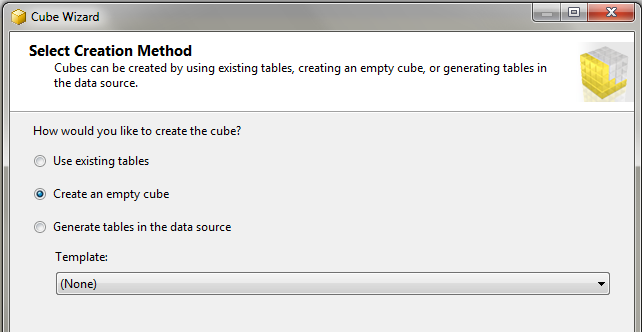 What if you have a really large fact table, and doubling your processing time and storage in this way is not an option? Well, stay tuned for part two when I’ll show you a trick to avoid doing this and only use one measure group. In my last post you saw how to join two tables together using conditions other than the built-in inner, outer and anti join conditions. However, as I mentioned, you need to be aware of some of the performance implications of using this technique – and that is the subject I’ll be looking at in this post. 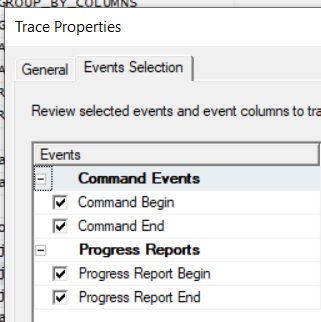 Let’s take the events-in-progress problem, one that I have blogged about many times in the past (see here, here, here and here for example) and see how we can solve it in Power Query. 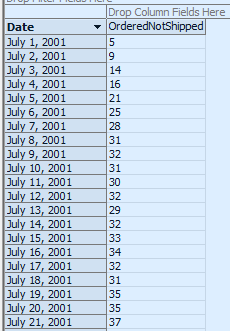 It’s a very common problem that you encounter when you have a fact table where each row represents an event, there are columns containing the start and end dates of each event, and you want to count the number of events that were in progress on any given date. 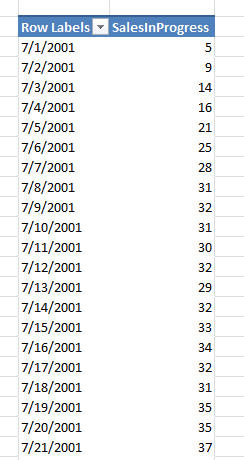 Using the Adventure Works DW database, my normal way of illustrating the problem is this: taking the DimDate and FactInternetSales tables, for each date show the number of purchases that had been ordered but not shipped on that date. 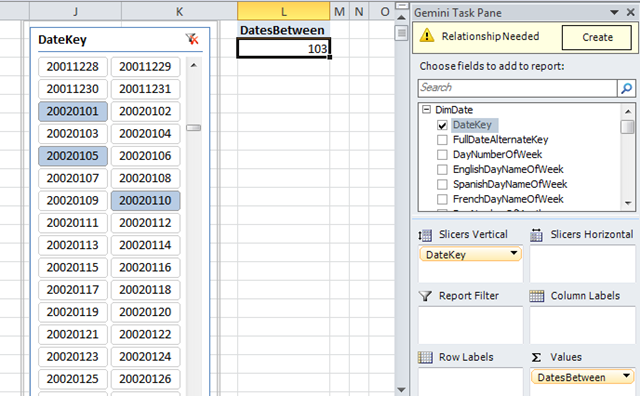 One way of solving this problem (but not the only way, as my previous blog posts show) is to do a cross join between the DimDate and FactInternetSales tables, then filter the result so that you get the rows where the value in the DateKey column from the DimDate table is between the values in the OrderDateKey and the ShipDateKey columns from the FactInternetSales table. There is, however, a big problem with this query: on my laptop it runs and runs forever – well, maybe not forever but I cancelled it after several minutes. Some tuning is necessary. 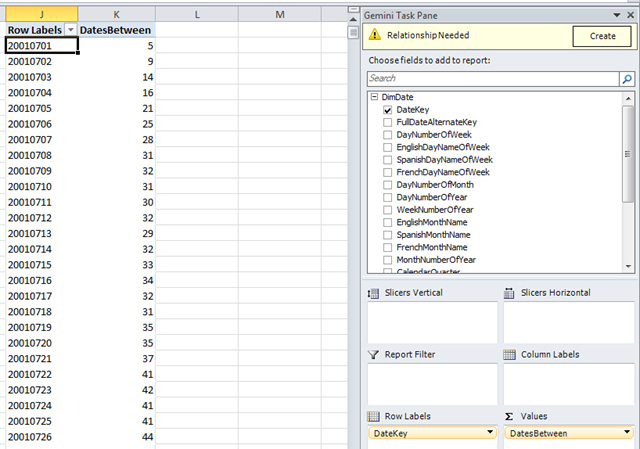 I don’t think anyone outside the Power Query dev team has much experience of performance tuning Power Query yet. 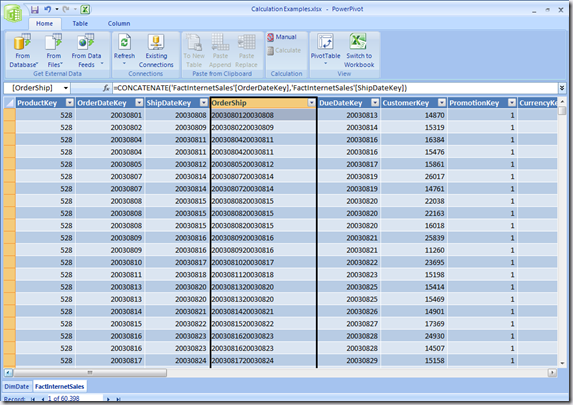 However there is one golden rule that I do know: where possible, allow Power Query to push as much of the work back to the data source. This behaviour is known as “query folding” and it’s something that I’ve blogged about, as have Matt Masson and Darren Gosbell. 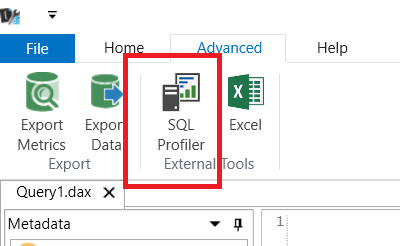 Looking in SQL Server Profiler for the query above it is clear that no query folding is taking place: the only activity visible is Power Query reading the data from the DimDate and FactInternetSales tables separately. 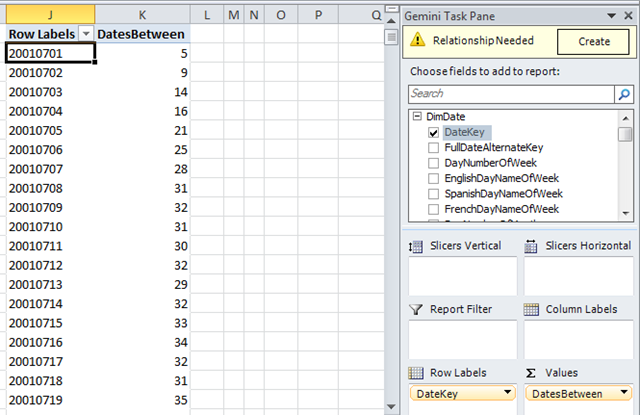 The main difference between this query and the previous one is how I’m getting a cross join between the two tables. 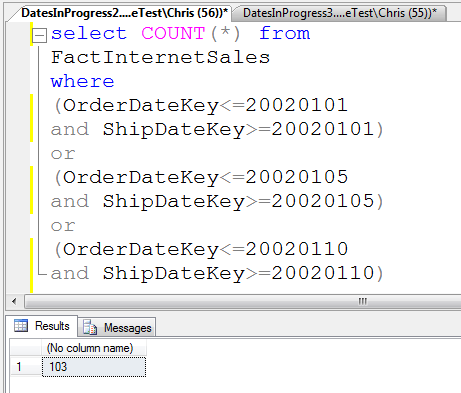 This time I’m creating custom columns on DimDate and FactInternetSales that both contain the value 1, and then doing an inner join between this two tables on the new columns – which of course results in the equivalent of a cross join. Query folding is definitely taking place now! With this change made the query now executes in around a minute. 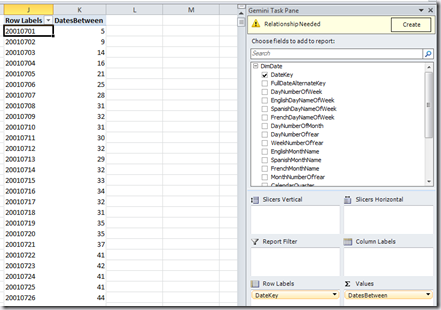 So clearly the new query is more efficient when it is executed inside the Power Query engine itself, without query folding, but the Power Query engine is still nowhere near as fast as SQL Server and query folding gives the best possible performance.